What is the best Le Club AccorHotels redemption? In my article yesterday, I outlined ‘the facts’ of the Le Club AccorHotels loyalty scheme. This article is my personal opinion, highlighting areas where I think you might want to focus. I think that Accor gets a slightly tough time from Head for Points. Part of the skill of miles and points is arbitrage – redeeming points at places which offer an oversized return. Because Accor has a ‘points equal cash’ structure (2000 points = €40 off), you can’t play that game. It also runs few big global promotions, and those that do run often have very narrow booking windows. This meant that it doesn’t get much editorial coverage. On a personal level, Accor does not seem to want to work with us – even though we sell chunky numbers of rooms for them – which means that we don’t get access to hotels to review, competition prizes or news on what they are doing. For the regular guest, though, Le Club AccorHotels works well. If you are Platinum, you are getting 8.8% of your room bill back in Accor vouchers. Spend a working week in a Sofitel running up a £750 bill and you will ‘earn’ £66 for yourself – albeit £66 you need to spend in another Accor hotel. My experience of Accor properties is not extensive. However, their UK network is surprisingly good, with Novotel and Mercure hotels in most major business cities. The Sofitel St James in Mayfair is a very impressive UK flagship and a decent place to spend your vouchers if you wanted a break in London. We have reviewed two new UK Accor hotels in the last couple of years and both were impressive. 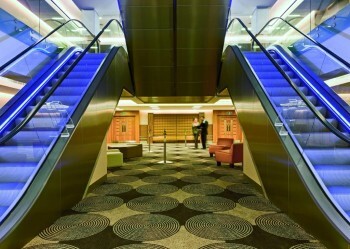 Novotel Blackfriars (review) has the new contemporary look being rolled out across the chain (and a swimming pool). The new ibis Styles at Heathrow (review) is also showcasing a new, modern design – despite “only being an ibis” I think any HFP reader would be happy there. For the average Head for Points reader, the programme got less valuable last year. The loss of Platinum status for American Express Platinum cardholders impacted many of us, although we have had a soft landing to Gold for 2018. The fact that points earned from promotions no longer count towards status has hit those who earned status via stays but tried to be canny in how they did it. If Le Club was a ‘normal’ loyalty scheme then the addition of Raffles, Fairmont and Swissotel would be very exciting. Imagine being able to redeem a handful of points for The Savoy in London for example. In reality, the revenue-based redemption model means that the acquisition has been welcomed with little more than a shrug. All that said, it would be unfair to criticise the scheme too much. If you manage to earn Platinum, stay in brands which have lounges and are happy to use your points for hotel room discounts, it can work out well. Where has all BA's First Class Avios availability gone? Accor is a funny scheme for me. At one point I was using them all the time as I was Platinum and their Happy Monday deals were great. I live on the fringes of London but as you could get hotels for £40 a night in central London I would use them a lot as it meant I could stay out and get razzled and not have to pay £60+ on Uber. However, all of that changed with the withdrawal of Happy Monday and my Platinum status as now I have no reason to stay as: a Gold does not get much, there promotions are fiddly, there is no arbritage on their points and their customer service is very poor in relation to the other brands. Personally, until the bring back either Plat for Amex Plat’s or HM’s I am unlikely to go back and just cash out my €260 worth of points. Two years ago, the Sofitel T5 was a great perk, having Platinum status with Amex Platinum. I used to stay there the night before an early flight and enjoyed the selection of wines and food in the lounge – it was rarely full. However, I stayed there a few times towards the end of 2017, and again in January and the lounge was crammed to capacity, and closed at 8.30. Not what it used to be, unfortunately. My Partner is Accor Platinum through work (She stays 2-3 nights a week in the same hotel). Although I tend to prefer Hilton, the points she accrues allow us access to decent places for those one-night stays when out for the night (say at a gig). The Novotels are perfectly pleasant (including Blackfriars) and are pretty much a minimum requirement. The Accor acquisition of Fairmont was bad news for Fairmont Platinum members like myself. The Fairmont scheme is probably one of the best hotel loyalty schemes for top tier members, with 2 suite upgrade vouchers (used at time of booking for the whole stay), a free night voucher, 2 room upgrade vouchers, 100 USD credit, free gym kit loan for each stay, and the option of a further bonus suite upgrade voucher or $100 F&B credit. The Accor scheme will not measure up well. Interesting that IHG gets a (deserved) slating for Spire only getting possible lounge access at Crowne Plaza chains. I’m wondering why Accor does not get the same criticism for only giving Platinums lounge access at Sofitel chains? It seems to me the areas I travel there are more CP’s than Sofitels which is one of various reasons why I would always choose another hotel group over Accor where available. Are there any Novotel hotels with a lounge? The key with Sofitel is that the benefit is GUARANTEED. If it’s got a lounge, you’re getting (subject to capacity issues). IHG can’t even promise that. True. Not all the hotels have a lounge, though. This is a company that could not give a flying fart about customers. Accor hotels do not have a customer relations department.